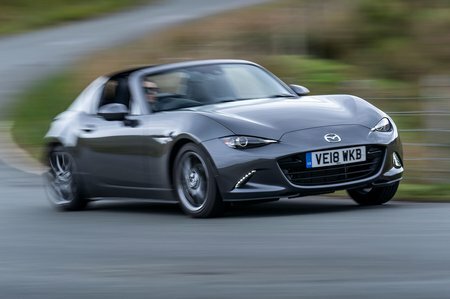 Mazda MX-5 1.5  SE-L Nav+ 2dr 2019 Review | What Car? What Car? will save you at least £1,370, but our approved dealers could save you even more. The Mazda MX-5 RF is as fun to drive as its Convertible sibling while handling is actually an improvement over the soft-top. Boot space isn't hindered, either. But the step up in refinement isn’t enough to justify its extra cost, and rivals such as the Toyota GT86 offer a bigger, faster package, even if they don't have a convertible option. The entry-point into RF ownership gets goodies such as climate and cruise control, LED daytime running lights and 16in wheels. A comprehensive infotainment package includes a six-speaker stereo, sat-nav, smartphone connectivity, Bluetooth and a DAB radio, all operated through a 7.0in screen. Go for the more powerful engine and you also get bigger 17in wheels and a limited-slip differential. This entry-level engine is rev-happy and just about brisk enough to be interesting.